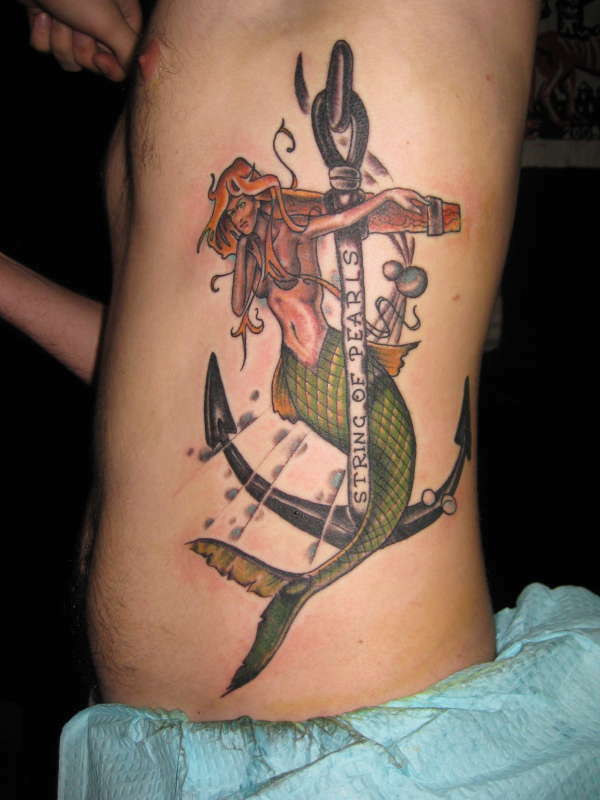 Here is my "mermaid on an anchor". It's on my left side all up my ribs. I got it as sort of a "family emblem" representing my family's affinity for the ocean. My last name is Pearl and my birth certificate reads "In Addition to Our String of Pearls...". Also, we had a sailboat called "String of Pearls". Took 4 1/2 hours all in one sitting. Done by Ed Dieringer at Electric Ladyland Tattoos in New Orleans, LA. It looks like she has a squid on her head. that's cool, looks good. The face is a little on the angry side but who says all mermaids are happy? This aint disney. Yeah. Some say she looks a bit angry. But I'm okay with that. That's really good, but the face looks somewhat odd.